The final, seemingly “simple” summation, “a ‘Teacher of Dancing,’” however, is not all that easy to understand. To take it literally is to run the risk of being misled, to think that the Movements might stand alone as an expression of the teaching. The call for “harmonious development” demands attention to the work of all the parts of the human being—in different conditions. The work in movements is one condition; from the beginning, it is clear that other conditions are needed if one wishes a full experience of Gurdjieff’s teaching. It is said that Shiva danced the world into being, and the Talmud states that the primary function of the angels is to dance, making dancing by humans an expression of thanksgiving for renewal and fruitfulness. Sherpa lamas in Nepal dance to balance the worldly with the divine, and in Zambia, dance serves to mediate between childhood and adulthood. Among the Dogon, it restores order at the moment of death. 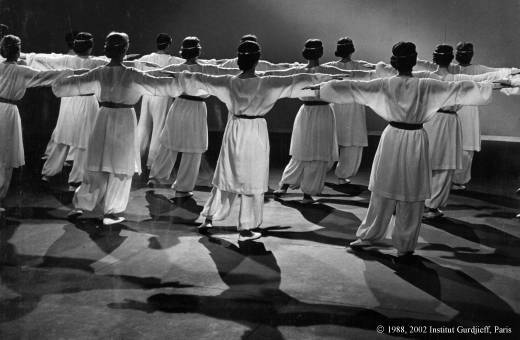 Turning, either as whirling or moving around a circle, appears in Sufi, early Christian, and Buddhist ritual dances, symbolizing the relationship between the level of the dancer and other, inner, and higher levels of energy and consciousness. These divine processes, governed by law, are also movement, which can be understood only partially by the mind, can be only felt in a limited way by the heart, can be only performed incompletely by the body. The centers—alone and separate—are incapable of participating in these processes, are unable to enter into the dance by themselves. But when the three parts come together, there is a completely new possibility, and Gurdjieff’s teaching shows the way towards that unification. The men and women who came to work in Gurdjieff’s “Institute for the Harmonious Development of Man” were people with deep questions about the sense and meaning of their lives. At the Institute, these questions were given new latitude through their participation in practical tasks, exercises, and “sacred gymnastics”—all under the watchful eye of Gurdjieff. In these rarified conditions, they began to discover a kind of attention unknown to them before, an attention issuing simultaneously from the mind, body, and feeling. As we have heard from those who were with him, Gurdjieff meted out precisely what was appropriate to each person, according to type and essential need. He could treat someone with tenderness and compassion at one moment, shout at him at another, and at a third, gaze at him without uttering a word. In each case, the person received exactly the shock needed to see how and what he was in that very moment. Ellen Dooling Draper is a member of the Gurdjieff Foundation of New York and a previous editor with Parabola Magazine.